A lovely documentary on mathematical origami, called Between the Folds, has been posted to youtube. The DVD costs $20, which seems quite reasonable to me. This youtube posting is not from the producers, Green Fuse Films. I've contacted them, in case they want to have it removed. Watch it quickly if you'd like to. The official trailer is also on youtube, so you can get a taste, even after the pirate version is gone. A student came to me last week for help. He wants to use fabric (a very loose weave, which will stretch some) to cover a sphere. He needed to know what shape to cut. I had no idea, and first suggested he look at information on world maps. He wants nice seams and no puckering. I thought a shape that wrapped around the equator, with sort of triangular tabs up and down to the poles might work. We knew the sides of those needed to curve, and he wanted an equation. I thought he should experiment with 8 tabs in each direction at first, and those would need to have a 45 degree angle at the pole. I had no idea what kind of equation would fit this. A former student, who designs and sews clothing, was in the math lab, and I brought him into our conversation. 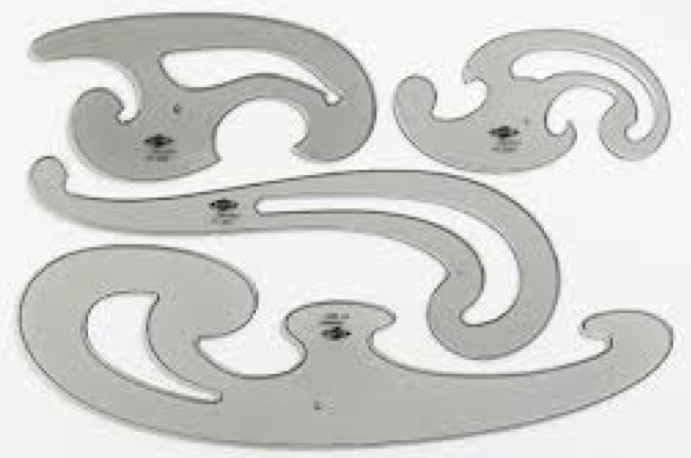 He said he would use a French curve, which is what you see in the image above. We looked it up, and no one seems to know the equations for the curves. So my question is about the French curves. Can anyone help me figure out their equations? The coolest thing happened as I began to write this post. I was trying to sketch my pattern idea freehand, and I'm a terrible drawer. So I turned to Geogebra, and started putting in the points and lines. When I got to the curved segments, I was in the right frame of mind. I knew I needed something between the points (0,.5) and (1,3.5), with a vertical tangent at (0,.5) and a slope of 1 (same as 45 degrees) at (1,3.5). I knew that the square root function starts out with a vertical tangent, and so I figured I'd try to modify that. Getting it to go though those two points, I was having trouble getting the slope at the top right. (I think there's a way...) So I figured I could change what root I used. And I solved the problem I had posed! (Always a rush.) The first curve is y = 3 times the cube root of x. The next one in the same direction is y = 3 times the cube root of (x-2), and the one between, that goes in the other direction, is y = 3 times the cube root of (2-x). They may not be just the right shape. My student will have to experiment at this point, I think. describe perfectly what we want. Ideas? In about a week, I'll be working with my students on solids of revolution. (At least, I hope to be. My calc II class is too small right now, and could be canceled.) 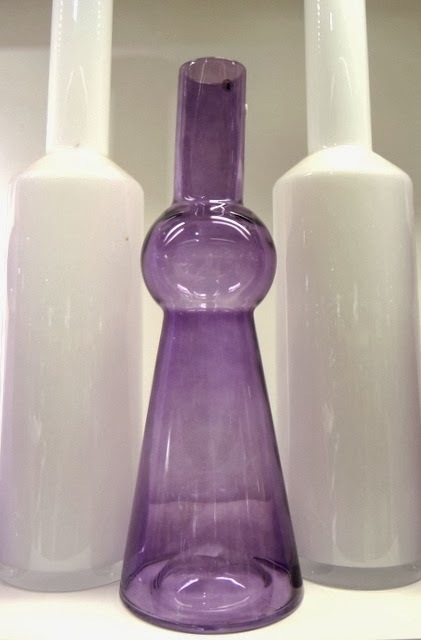 Patrick Honner's Math Photo post of three beautiful bottles exemplifying solids of revolutions inspired me. I looked up beautiful bottles on Google Images, and there are so many. Some of them are solids of revolution and some aren't. I wonder if my students would benefit by identifying which are which. Maybe this Friday I can get some students to come in and work with me on making models of volumes (not volumes of revolution, though), like these that Bowman Dickson made, or these (both types) that Rebecka Peterson made. There are many great math calculation resources online. Wolfram Alpha is probably the most well-known. I've used it often from home, where I don't have a calculator. I used to create graphs there that I could copy onto my handouts and tests, but now I use Desmos for that. Wolfram has lots of interesting features, but it must be hard to make sure everything works just right. There is a statistical procedure to find the line or curve of best fit given a number of data points. If the data points are exactly on a line or curve, you'd think it would be especially easy. But somehow it isn't. I was asking Wolfram to give me an equation like y=ax2+bx+c, which would go as near as possible to the points (0,0), (1,1), (2,4). 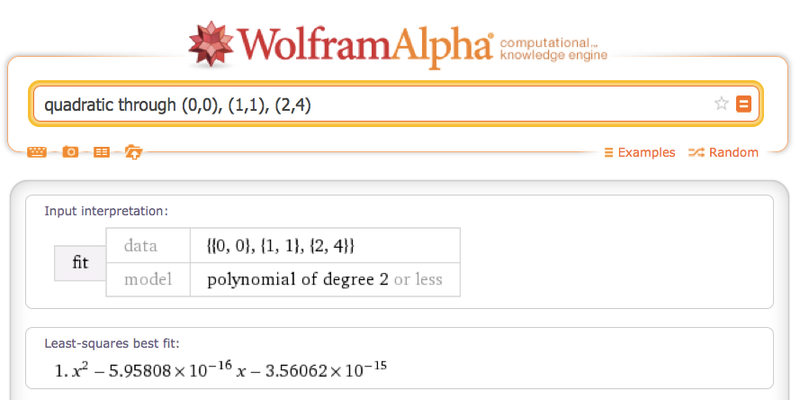 The right answer is y=x2, but Wolfram gives an answer with teeny tiny x and constant terms added in. A quick Google search doesn't turn up any information on why this happens. I learned about it from David Cushing on Aperiodical. It turns out that if you ask for a parabola instead of a quadratic, you get the right answer. The wrong answer happens because the computer is using a complex procedure which produces numbers that can only be represented approximately on the computer, and some very small round-off errors show up at the end. A friend linked to this on Facebook, asking: "Can you explain a hard idea using the ten hundred most common words?" So I decided to try to explain calculus. What I wrote seems pretty bad. My explanation from October seems much clearer. But I thought I'd share. Will you try it with a math topic? (I'd love to see a better description of calculus.) Here are some of the words you can't use: math, slope, steepness, circle, curve, and infinity. About calculus:Some lines are straight. Some are not. It's easy to think about how much a straight line goes up as it goes over. It's harder to think about that when the line is not straight. Two guys figured out some good ideas to help think about this around 1670. They cared because it would help people think about the world. How fast do things fall? How does light turn when it goes through round glass? How do we find the best way to do something? Their ideas also help us think about areas that don't have straight edges. To think about these things, we need to think about something bigger than any number, about two things closer than any number can say, and about cutting smaller parts than any number can say. Thinking about this in just right ways takes some hard thinking.